Today’s Blogging 101 assignment is to look up blog “events” and enter an event. The one I’ve chosen, after looking at oodles, was the Phoneography Photo Challenge, where you take a photo (that matches their theme for the week) with your phone, or other non-SLR digital device. I’m not quite embarrassed to say that I do not own a smart phone. And rarely use my 10-year-old cell phone. 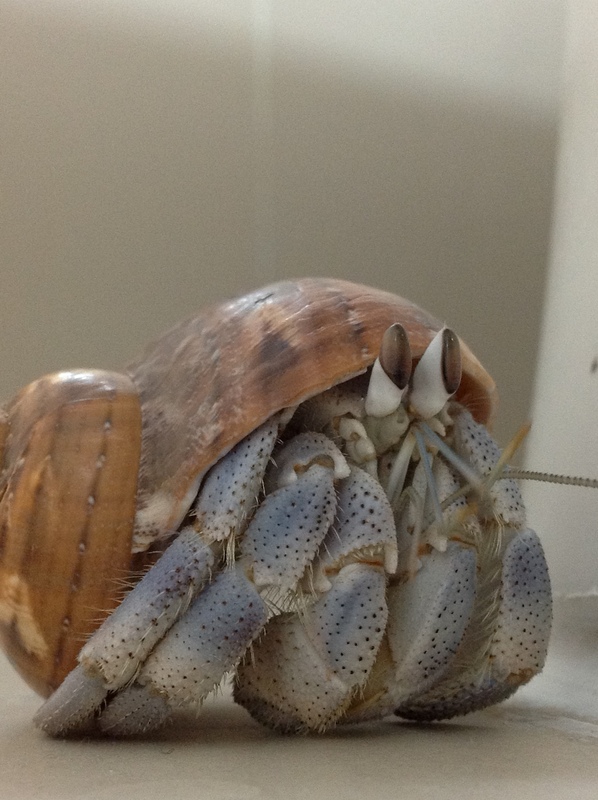 So I used my iPad to photograph Duncan, my hermit crab. Also, the Challenge prefers you publish on Monday. But I just found it, because of the 101 assignment, so I’m a little late. Also, I’m supposed to place their icon on my homepage, but I don’t know how to do that, and I’m also having problems figuring out how to add (and delete) pages on my menu. They call them learning curves for a reason. To add/delete pages just go to the dashboard and click on ‘pages’ in the left-hand column. Will get back to you re the icon. I’ve done it but I have to remember how. Thanks. I thought I understood that. But…had two weirdnesses. One weirdness was the new pages were going to the sidebar under “site pages”. It seems redundant. I guess I should not have pages on the top and in the sidebar, eh? The other weirdness was I was clicking “new page” instead of “post.” You think that has something to do with getting old? Because I didn’t used to be stupid. For a long time during the last month of creating this blog, I was completely lost…because the directions kept saying go to “appearance” then to where ever. My theme/site does not have “appearance.” It uses the words “look and feel” instead. I spent hours looking for “appearance. So I’m guessing you’re using the new editor, which I’ve refused to switch to, and I’m still on the old one. And that’s another thing WP has missed in their ill conceived creation of the new editing page is they’ve forgotten to give instructions that match with the new terminology. Ugh and Grrrrr. I’ve read a bit recently about the new version of the editing page and the other changes they’ve made and it sounds pretty dreadful so I won’t switch until I’m forced to. And then I’ll have to learn all the stuff you’re learning all over again. Ugh and grrrrr again! Also I noticed not everyone does the logo anyway. Are you going to do the award? Jeeesh! What else do I have to learn just to be a blogger? I tried the cut and paste, which as you said, didn’t work. But then…and now I can’t remember if I read it or just stumbled upon it…I pasted the url into some slot and Voila! logo on my page (I won’t be able to do it again, so I guess I won’t enter anymore Challenges??? I’m delighted to have you as part of the challenge,and wonderful to have you as part of the photo community. Your capture brings a huge smile to me this bitter cold morning. Makes me think of Spring and Summer walking at the seashore. Happy Photo Challenge. Also while many do post on Monday, others will post during the week. Thanks, glad to be a part of this. Love your concept. I’m not a professional, but I simply HAVE to take photos…of whatever–a Corvette, a crab, my belly button. One thing–when I tried to add the other site, I got a very weird website with links to news articles (same blog name) and nothing to do with photography. Is that the right site? I’m not sure I could even follow it. Strange, right. However, yours worked, it’s the other lady (forgot her name) whose didn’t work. Can you tell me something? I’m not clear on pingbacks. And a pingback just appeared on my site. Did you create that? And what does it do…or connect to? I guess it goes back to your site, eh? But what’s the purpose? Do other see it? Glad to have you join. What a wonderful shot! Hope to see more of your photos. THANKS, Janet, good to be part of it. Just visited your page…awesome design!! And photos!